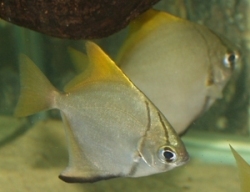 Size: 10" (25cm), but usually smaller in aquaria. Compatibility: Semi-aggressive towards its own kind, and is therefore best kept in a group of 5-6 or more to spread out the aggression. 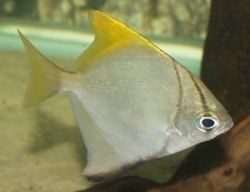 Generally ok with other similar sized brackish fishes such as Scats and Archerfish. Water chemistry: Maintain in brackish conditions. Juveniles are often sold in fresh or slightly salted water, but high-end brackish or marine conditions are preferable for adults. Feeding: Omnivorous and will accept most aquarium foods, provide a varied diet including plenty of vegetable matter. Will eat live plants. Breeding: Rarely accomplished in captivity; changes in salinity are required. Comments: A second Monodactylus species, M. sebae (often known as the Finger Mono) is fairly common, and has similar requirements.